Got cellulite? Welcome to the club! The cosmetic condition affects nearly 90% of women at some point during their lives, even those who are lean and fit. And while beauty standards are always evolving, it’s undeniable that one of the most common issues us women have is still to get rid of cellulite. We can thank magazine and social media portrayals of the “ideal” body for constantly making us feel that cellulite is ugly or not “normal”. But the truth is, it’s really, really normal, and for many women, unavoidable. So why are we still spending our time and money trying to get rid of it? Cellulite occurs when underlying fat deposits begin to push through layers of collagen fibers, or connective tissue, under the skin (often in the hip and thigh areas, but also on arms, stomach, and other common sites as well). A combination of fat cells becoming larger or increasing in number, a thinner collagen layer and change in blood supply may lead to cellulite. Connective tissue can be weakened by hormones (most significantly a decline in oestrogen levels as we age) , lack of exercise and muscle tone, excess body fat, ageing, and poor circulation which can make these fat deposits more visible. There’s also a significant genetic component to it. If your mother and grandmother had cellulite, you have a better chance of also developing it. Cellulite is not a medical problem and does not have adverse health consequences. Despite what you might read on their labels, no topical creams—prescription or over-the-counter—have been shown to permanently reduce the appearance of cellulite. Most of these products work by tightening the top layer of the skin, but after a few hours their effects wear off. Special “cellulite diets” claim to be effective in treating cellulite. Proponents of these diets claim that the combination of foods can reduce inflammation and improve circulation in affected areas and reduce cellulite. However, no studies published in medical literature have supported these claims. While eating a healthy, balanced diet can decrease fluid retention and improve the overall health and appearance of skin, specific diets designed to target cellulite do not work. Several products have been marketed and contain a variety of ingredients such as ginkgo biloba, sweet clover, grape-seed bioflavinoids, bladder wrack extract, evening primrose oil, fish oil, and soy lecithin. These preparations claim to have positive effects on the body such as boosting metabolism, improving circulation, protecting against cell damage, and breaking down fats. Such claims are difficult to evaluate, as concepts such as “metabolism,” “circulation,” or “cell damage” cannot be easily measured on an objective basis to determine whether or not any improvement has been achieved. Furthermore, there are no valid clinical studies to support the use of these dietary supplements for the treatment of cellulite, and some dietary supplements for may also interact with certain prescription drugs. The concept of dry brushing is to increase circulation and lymphatic flow in the tissue, to reduce swelling, improve lymphatic drainage, and improve circulation and oxygenation of the skin and tissues. In reality, the temporary increase in circulation can result in a temporary plumping up of the skin, which hides cellulite to some degree. When the circulation slows back down however, so does the swelling. It does not reduce cellulite, but may cause it to be temporarily less visible. Pure liposuction involves extracting fat by vacuuming it from under the skin and is not effective for cellulite. It can actually worsen the appearance of the skin by sucking out the cushion of fat that resides just under the skin, resulting in additional dimpling of the skin – not ideal! Studies about the effectiveness of these therapies have shown conflicting results. While some do result in a minimal improvement, quite often you’ll need regular maintenance treatments after achieving the initial effect or the cellulite will return. SO HOW CAN WE ACTUALLY MINIMISE IT? While there is no magic “diet” or “exercise routine” that will get rid of your cellulite, you can minimise it through optimising your nutrition and training. If you are ‘overweight’ and your body fat is quite high, then fat loss may be beneficial to reducing the appearance cellulite (not to mention improving overall health). To lose fat, you must be in a calorie deficit where you are consuming less calories than you are burning (click here to see how many calories you should be eating). It is important to note though, if you are at a healthy body fat percentage, more weight loss may not improve the appearance of cellulite (cue genetics discussion). Weight training can also help with reducing the appearance of cellulite. By focusing on weight training, you will build lean muscle and improve your body composition, making your body look firmer and tighter and reduce the appearance of cellulite. But quite often, it will still be there! I myself have cellulite, along with many other personal trainers and fitness models I know (some are just really good at hiding it), even though I perform weight training 5-6 times per week and eat a balanced diet. It’s definitely not something that keeps me up at night! Smoking cessation is another evidence based way to reduce cellulite. As we know, poor circulation is a causative factor and cigarette smoke has been shown to reduce blood vessel flow and weaken and disrupt the formation of collagen. This allows the connective tissue to become stretched and damaged more easily and for underlying fat to show through. So if cellulite is almost impossible to prevent or get rid of, and pretty much all women have it, why are we still trying so hard to get rid of it? I’m all for working towards your fat loss goals, especially when it is going to help improve your overall health and reduce your chances of disease. But at the same time, it’s important to acknowledge that it’s 100 percent OK to not care about whether you have cellulite. 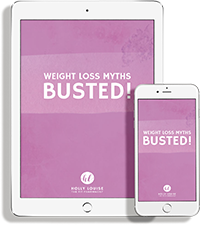 Switching your mindset might even help ease some of those body image fixations. When you understand that cellulite is just a NORMAL part of being a woman, you will realise that eliminating it sometimes just isn’t possible, and pouring your emotional energy worrying about is a waste of time.